Egypt closed the Rafah border crossing, which connects it to the Gaza Strip on Saturday after two days of opening the crossing in both directions. Gaza's Interior Ministry Spokesman Iyad Al-Bozom said in a short statement on Facebook that 1,526 people were able to leave Gaza in an exceptional opening of the border crossing. "There remain more than 23,000 humanitarian cases that urgently need to travel," he said. The border crossing was scheduled to be opened on Thursday and Friday, according to an Egyptian announcement last week. Bozom said "we appreciate" the Egyptian role's continued opening of the crossing until this morning but called on Egyptian authorities to extend the opening, citing the "magnitude of suffering" in Gaza. According to Gaza's interior ministry 1,148 people were able to leave Gaza for Egypt, and 561 people who were stuck on the Egyptian side crossed over to the Strip on Friday alone. Egyptian authorities turned away 87 travelers without providing a reason, the Gaza interior ministry said, citing the Palestinian authority for crossings. Figures for Thursday were provided by Egypt's state news agency MENA, which said that on that day 647 people crossed in and out of the besieged Gaza Strip, whose main entry and exit point is the Rafah border crossing. Eighteen truckloads of aid including school supplies, food supplies and blankets were delivered to Gaza over the past two days, Gaza's interior ministry said. 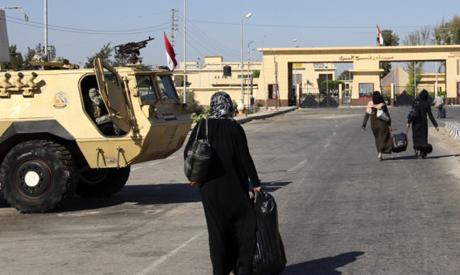 The Rafah border crossing, which is the main entry and exit point to Gaza, has been mostly closed since October 2014 when a militant attack in North Sinai left over 30 Egyptian security personnel dead. According to a report issued by the UN Office for the Coordination of Humanitarian Affairs, before last week's two-day exceptional opening, the crossing was only opened partially for 37 days, and that its closure also shut out "humanitarian assistance". Gaza measures around 360 square kilometres and is home to 1.8 million people, making the enclave among the world's most densely populated areas. Having been under seige for the past eight years, economic and living conditions inside the Strip are dire. In May 2015, the World Bank said, "blockades, war and poor governance have strangled Gaza's economy and the unemployment rate is now the highest in the world," adding that the enclave's economy is on the "verge of collapse". The difficult living conditions in the enclave were worsened after destruction caused by 50 days of Israeli military operations in the summer of 2014. Last year, Egypt and Norway co-hosted a donors conference on the reconstruction of Gaza, raising over $5 billion. However, the international efforts to raise money for reconstruction have had little effect on the ground. According to the World Bank, which is monitoring the delivery and disbursement of pledges, by August 2015, only 35 percent of pledges had been disbursed. In September 2015, the Egyptian army began flooding the underground smuggling tunnels that supplied essential goods to the besieged territory. Egypt has been fighting a growing militancy in the North Sinai region. Destroying the underground tunnels leading in and out of Gaza was one of several counter-terrorism measures the Egyptian state has adopted. Egypt sees the tunnels as a pathway of arms and militants, forming a direct threat to the country's security. On the other hand, goods imported to Gaza "through tunnels, especially foodstuffs, medicines, fuel, construction materials and cars, have spared the Gaza Strip the breakdown of all vital sectors," the Palestinian Centre for Human Rights said in 2013.